Butter beans are mature lima beans. They are flat and white, and taste creamy, rich and buttery when cooked. 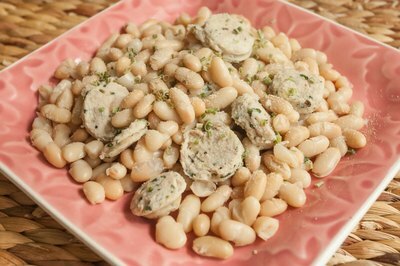 Whether dried, fresh or frozen, butter beans require a long cooking period to soften and absorb delicious seasonings. A slow-cooker ensures that the beans cook at a low temperature, which helps them stay intact. Dried butter beans require soaking before they can be cooked. Soak beans for at least five hours in cool water. The warmer the water, the shorter the soaking time. Beans soaked in boiling water may be ready for cooking in as little as two hours. Longer soaks produce beans with a creamier texture, however, so an overnight soak or a maximum of 24 hours is ideal. As they soak, beans release a difficult-to-digest sugar, which can cause gas when consumed, so do not reuse the soaking liquid for cooking. Cook fresh butter beans after a thorough rinsing and soaked butter beans after draining. Use plenty of water to cook either -- roughly three times the amount of liquid -- stock, wine or water -- to beans. Add the beans, the liquid, and dried or fresh seasonings to the slow-cooker. Cook them on the low setting for as long as six to eight hours, until the beans are fork tender. On a high setting, cook them for no more than one to two hours, as overcooking can cause the beans to disintegrate. Add most seasonings, such as dried spices, minced aromatics -- like garlic and onion -- and meats, like pork hocks, at the beginning of the cooking period. Use other seasonings, such as acids and leafy herbs, after the beans have softened. The softened skins make it easier for seasonings to penetrate deep into the bean, producing a more flavorful dish. In the case of acids, such as tomatoes, lemon juice or apple cider vinegar, adding them too early can cause the skin to toughen, extending the cooking period. Store cooked beans that are cooled in a food-safe, airtight container in the refrigerator for no more than five days. Freeze cooked beans in bags or containers for as long as six months. Defrost them slowly in the refrigerator when you're ready to eat them, then enjoy them cold or at room temperature, or warm them up for a fast meal.